The Hawaii World War One Centennial Task Force is Hawaii’s answer to the call from the U.S. World War One Centennial Commission for all U.S. States and Territories to form organizations to lead their State/Territory commemorations. On 29 August, 2015, Governor Ige directed the formation of The Hawaii World War One Centennial Task Force to plan and lead Hawaii’s Commemoration of the First World War. 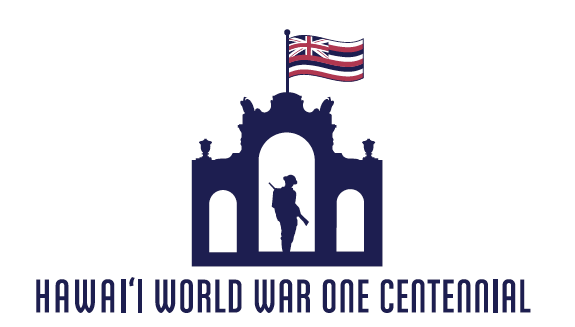 The Hawaii World War One Centennial Task Force is Hawaii’s answer to the call from the U.S. World War One Centennial Commission for all U.S. States and Territories to form organizations to lead their State/Territory commemorations. The National Commission was established by the World War One Centennial Commission Act, part of Public Law 112-272 passed by the 112th Congress and signed by President Obama on January 16, 2013. The National World War One Centennial Commission is responsible for “planning, developing, and executing programs, projects, and activities to commemorate the centennial of World War One; encouraging private organizations and State and local governments to organize and participate in activities commemorating the centennial of World War I.” The Hawaii World War One Centennial Task Force carries out these same tasks for the people of Hawaii. The Hawaii World War One Centennial Task Force is composed entirely of volunteers from Hawaii’s Military Veteran, Academic, Professional and Civic organizations. The Hawaii National Guard, Veterans Affairs, and four Veteran organizations are represented in the membership of the Task Force, along with volunteer members from the ranks of academia, industry, and civic organizations. World War I remains America’s forgotten war, even though more Americans gave their lives during that war than during Korea and Vietnam combined. In Hawaii, then a Territory of the United States, over 10,000 men volunteered to serve, and the War touched the lives of nearly all of the citizenry. Honoring and remembering Hawaii’s military veterans who served during the Great War, we seek to educate Hawaii on our local contributions to the War effort and to help facilitate grass-roots centennial commemorations. The Hawaii World War One Centennial Task Force seeks to partner with the local community in planning and conducting grassroots commemorations across many communities, to include: The U.S. Armed Forces, Hawaii’s professional and trade communities, Universities and Schools, Civic and Relief Organizations, City Governments, etc. As our research team identifies events of significance that are worthy of commemoration, the Task Force will engage appropriate organizations who keep that history alive, and work to partner for a meaningful commemoration event. The Task Force will advise partner organizations on event planning, and will endorse appropriate events and include them as part Hawaii’s official commemoration program. We are very thankful to our sponsors who have allowed us to make the Hawaii World War I / Veteran’s Day Commemoration an exciting full-day, free-to-the-public event. Mahalo! To learn more visit the official World War One Centennial Website.